In carrying out the tests on this blog I can dictate some of the possibilities, sure, but overall the outcome is really about forming a deeper understanding what happened and applying new appreciations. 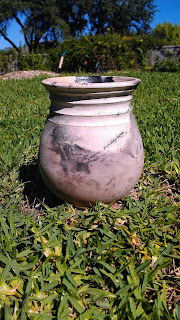 In an uncontrolled experiment to appreciate change in a single pottery vessel, I left a jar alone outside for the last eight years. I like to measure the movement of charcoal, uncover, map and refit my early attempts at flintknapping, and set pottery out to die. By doing these kinds of tests I am able to see continual to change over time and observe natural forces as they reshape the contexts that supply behavioral information to archaeologists. As I often come in contact with materials older than 50 generations at least, I understand that the residual of my experiments will also last much longer then my own skeleton. 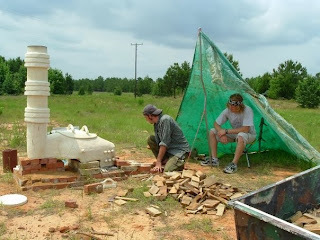 About eight years ago a good friend of mine, Brad Thomson, and I spent a summer finding and using wild clay as well as firing commercial clay vessels out in the piney woods of East Texas. We had a great time that summer; I sent the biggest flake I had made to that point into my ankle bone. Thinking back on that blood-filled boot, it wasn’t a big flake at all, and the issue was totally caused by user error. Fall 2013. Just look at how the trees have grown! Vertical and horizontal cracks forming in situ. 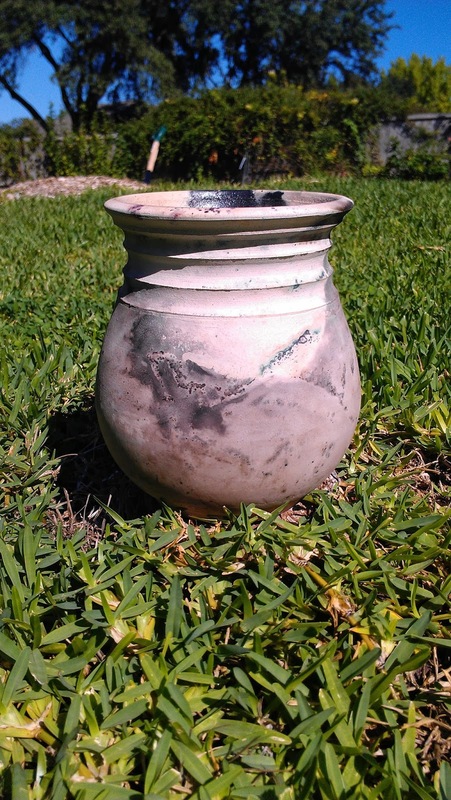 Ceramic vessels do not break into a series of sherds that follow a normal distribution of roundness. As shown in this test, a vessel initially breaks apart into large angular pieces. From there, trampling by wildlife, people, movement by water and abrasion by wind move sherds towards a more rounded shape. Also, Spalling due to fire or chemical precipitation can make sherds smaller yet still angular. So, if one recovers an assemblage of small rounded sherds, the question must follow: were these intentionally rounded by prehistoric peoples, or are they the result of abrasion by natural processes that have also removed them from their original context. Of course when items are out of context our job of interpreting prehistoric human behavior gets a lot harder. 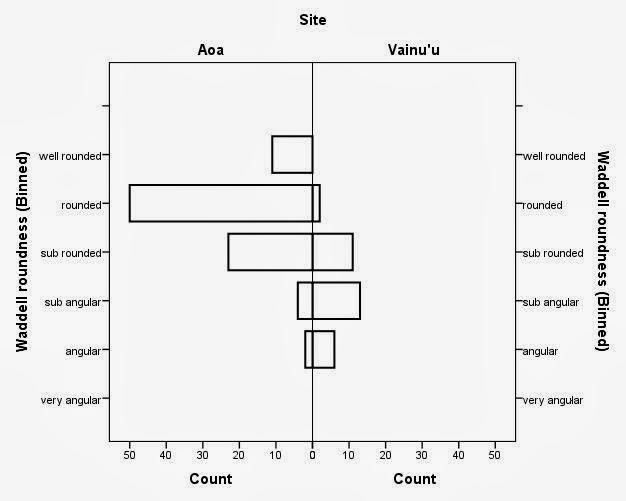 See, for instance, the difference in sherd roundness between two sites that I study in Samoa. I produced roundness measures using something called the Waddell Measure of Roundness where you divide the mean radius taken from each corner by the maximum-sized radius that can be inscribed within the sherd. 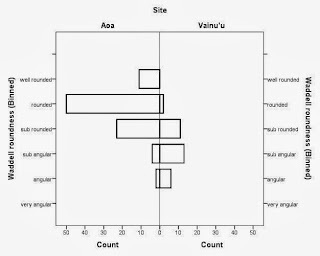 This test shows that sherds at the site of Vainu’u have seen minimal post depositional damage by water while sherds at Aoa have been significantly affected by tumbling due to water transport. The overall significance here is that because the sherd assemblage at Aoa has become restructured by water transport, we can't really say a whole lot about pottery production over time with any confidence. A visit to each site quickly shows differences in depositional history and erosion. Vainu’u is flat and covered in vegetation while Aoa is on a slope and has a stream running through the area. The shapes of pottery fragments from these two sites correlate well with the visible difference in landscape topography. 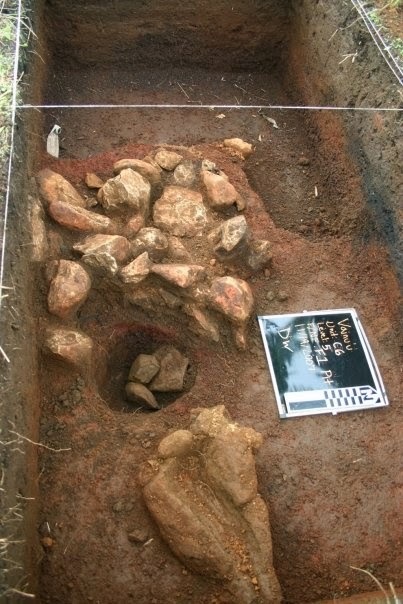 Intact hot rock cooking feature at Vainu'u. Change over time, what a thing to watch.